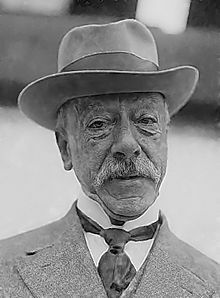 Today in Masonic History Ernesto Nathan is born in 1848. Ernesto Nathan was an British-born Italian politician. Nathan was born on October 5th, 1848 in London, England. His parents had both immigrated to England, his mother from Italy, his father from Germany. At the age of 14 his father passed away. He spent much of his youth in Florence, Lugano, Milan and the island of Sardinia. It was on Sardinia that he was called on to administer a cotton mill. In 1870, Nathan was inspired by Giuseppe Mazzini who advocated for the revolutionary idea of unifying Italy and moved to Rome. It was in 1870 that the final act of unification occurred with what is referred to as the Capture of Rome, this marked the final defeat of the Papal states under Pope Pius IX and the unification of Italy. In Rome Nathan's house became a hot spot for the educated to come and debate the political and social issues of the day. The relationships he created at his house in Rome would lead him to be a member of Parliament and part of Francesco Crispi's government when he became the 11th Prime Minister of Italy. In 1889, Nathan was elected to the Town Council of Rome. He would remain as part of the Town Council until he was elected Mayor of Rome in 1907. He would serve two terms as Mayor. His time in office is notable for changing the educational system to a more secular education from the Catholic dominated education that had existed since the Capture of Rome. Further driving a wedge between Nathan, who was perceived as anticlerical, and the Holy See. Further complicating his relationship with the Vatican, Nathan was the Mayor of Rome in 1910 during the 40th anniversary of the Capture of Rome. Nathan passed away on April 9th, 1921. Nathan joined Freemasonry in 1887. In 1899 and 1917 he became the Grand Master of the Grande Oriente d'Italia.